PHILADELPHIA, PA and SAN FRANCISCO, CA--(Marketwire - Feb 25, 2013) - The Wharton School of the University of Pennsylvania and Cisco (NASDAQ: CSCO) today unveiled the learning experience of the future -- one that blends life-size visual communication via telepresence with collaboration technologies that significantly enhance the way faculty, students and alumni interact and learn, no matter how distant they may be from physical classrooms. 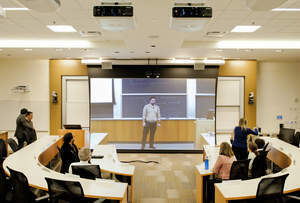 While educational institutions have been on the cutting-edge of technology use for years, the Wharton School and Cisco initiative is taking that to a new level by using life-size, high-definition visual communications--based on Cisco TelePresence® technology -- to virtually connect classrooms physically separated by thousands of miles. This single-classroom experience is so immersive that Wharton has given the two rooms a special classification, informing students that beginning this spring, bicoastal classes will be held in the "Cisco Connected Classroom." That means that all students, regardless of location, will be able to collaborate and participate as if they are in the same room as one another and their professor. Today, Wharton School and Cisco will showcase the capabilities of the "Cisco Connected Classroom" during on-site demonstrations at Wharton's San Francisco and Philadelphia campuses. Three thousand miles separate the students in Wharton's Philadelphia and San Francisco campuses. However, thanks to the combination of a floor-to-ceiling screen at the front of one classroom and 80-inch LED monitors on the side walls of each room, as well as large projection screens in the rear, students and faculty feel as if they are learning and interacting in the same physical space. From the viewpoint of the professor at the lectern, students on the other coast appear to be seated in rows directly behind the local students; the students in the remote classroom see the professor projected in life-size high definition on the floor-to-ceiling screen. Wharton will also utilize the Cisco® Capture, Transform, Share (CTS) video platform to enable professors to record lectures and make those lectures available for replay. This provides access to key content from any location and at any time, increasing the value and reach of each lecture and classroom discussion. Provide access to some of the world's leading experts -- wherever they may be. The solution will enable faculty or world-renowned guest experts in Philadelphia to teach and directly interact with students in San Francisco and vice versa -- expanding Wharton's community reach across the country. This effort can also help the institution reduce the need for travel. As Wharton continues to expand educational opportunities globally, such as its planned facility in Beijing, the system also will enable a single-classroom experience internationally and offer classes that would be otherwise unavailable to remote students. Improve the student experience. This collaborative solution also integrates Cisco Jabber™, Cisco's unified communications application, which enables students to join lectures from PCs and mobile devices. If, for instance, a student is sick or traveling and cannot be in the lecture hall, then Jabber lets them view the class and participate in the discussion. Additionally, through Cisco's CTS platform, professors can record sessions and make them available to students for review at a later time. Add more depth to executive education by increasing geographic reach. Cisco has a history of developing unique solutions for educational institutions and a strong corporate commitment to improving the quality of education. Through the Cisco Networking Academy™ program, the company's 21st Century Schools initiative and numerous engagements with nongovernmental organizations whose aim is to boost opportunity through education, Cisco has helped multiply the impact of technology on millions of students and teachers around the globe. "The use of video is rapidly transforming classroom engagement and interactions, while fostering new methods of collaboration, enriching the in-class experience, and helping better utilize school resources. Through technical innovations that aid in enhanced learning and teaching methods, Cisco, together with The Wharton School of the University of Pennsylvania, is excited to showcase the power and impact technology can have within educational institutions." "We are delighted to partner with Cisco on this project. This major technological advancement will connect Wharton's campuses and community in ways never before possible. The Wharton School and Cisco share a passion for innovation, and with this enhanced learning tool Wharton extends its role as a knowledge-creation leader."